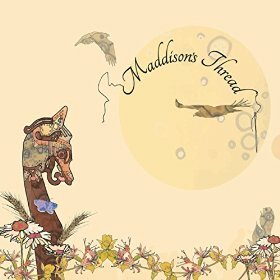 It was a Saturday morning, the postman called, a debut album from Maddison's Thread dropped through the letterbox, it was a busy period at work, end of year, long hours. So it was late Sunday when I slipped the cd into the slot. I'm glad I did, the music lifted me straight away, seductive melodies; mellow feel good songs, positive messages, slices of life served up with love and affection. The phrase "an incurable romantic" springs quickly to mind. Mind it's not soppy or slushy, rather heartfelt emotions evocatively expressed. You could be forgiven for thinking that Maddison's Thread had been recording together for years such is the smoothness of the music. Certainly it's an incredibly polished debut from Lee Maddison, a singer songwriter and self-taught guitarist from Hartlepool who grew up in a musical family that played skiffle and performed Buddy Holly songs. Maddison's Thread are Lee, who possesses a distinctive voice, Nigel Spaven on bass, the venerable Stewart Hardy who adds fiddle textures par excellence, Sue Ferris on flute and saxophone and Shona Kipling on accordion amongst others who add drums, keyboards, cello and trombone. An eclectic mix of instruments and of style. Opening the album, "The Viking's Daughter" reminds of Seth Lakeman, it was inspired by an etching of Herbert Thomas Dicksee. It addresses issues of lust, of unobtainable dreams, of desires. The lyrics conjure up visions that stay with you such as "Your silky dresses danced upon the sea breeze like golden lashes to whip a frenzy up in me". "Where Eagles Fly" , a daydream lost in time, two soaring birds, courtship rituals, a feeling of beauty which makes time float by. Time drifts assisted by soft soulful flute lines. There's elements here of the fragility of Nick Drake wrapped up in minor keys which brings in memories of the early Zombies. Elsewhere there's the joy de vivre of Ronnie Lane. It's staggering to consider this is Maddison's first recording; it has a confidence which stands head and shoulders above the norm. Warmth which helps makes you smile. "Making The Morning Last" Lee sings "Lock the door, come back to bed, lets lay a while instead for we've not nothing to get up for, as they say let's have a lazy day", it's smoochy ,smoozy jazz based, it's infectious. You want to make the morning last, make it shine, to make your own sunshine. And if the morning was good then "Wonderful Day" takes it a step further. Eastern European influences with a Buddhist bent "if I could inhale all the darkness in your life I'd share with you the lightness in mine". A positive song "I don't mind if I smile at every passer-by" turning grey days into bright. "Don't Care About Tomorrow" if you love Ronnie Lane's Slim Chance, " If you can see grace in a fallen leaf, if you can see heaven in a flower, if you can smile on a rainy day, you're gonna see it through tomorrow anyway". A song that rocks with a tasteful electric guitar solo. Not that's it's all bright, "Night Circus" is a view of late night town centres around closing time, clowns and loons, silk and steel. Roll up, roll up you can be the main attraction. And I'm sure you wouldn't want to be. "A Crooked Mile Home" closes the album, written as a tale of a staggering drunk alone on his way home, a sad sympathetic story of loss with nothing to look forward to, lifted by John Day's mournful trombone. A mantra of "never again" till the next time. Till tomorrow, till another crooked mile home. It's a thoughtful and sobering way to end. A Sunday night closure before a Monday morn. Or any other day of the week when you want to be positive, happy and believe in the best of the human race. Maddison's Thread, unravel and enjoy at your leisure.